eat run sail: 3 Cheers for Chia! I think it was about 5 years ago that I first discovered chia seeds and started eating them. I seem to go in little spurts with them... eating them often or not at all. Lately it has been very often. The more I read about them, the more I realize I need to add them to our diets on a daily basis. Yes, I said CHIA seeds... those little tiny black seeds that you once may have spread over the wet body of a clay sheep or a dog or even a kitten... and watched it turn into a green 'furry' CHIA pet as the seeds germinated and grew! Still available for sale on Amazon! Back in those days we didn't know the seed was edible; we just thought it was entertaining. Thank goodness for modern science. Now we know that chia seeds, once coveted by Aztec warriors, are one of the healthiest foods on the planet. They have nutrients that can have important benefits for our bodies and our brains. Calorie for calorie, they are one of the best sources in the world of several important nutrients. They are loaded with fiber, protein, Omega-3 fatty acids and various micronutrients. And when they are wet, they thicken somewhat and form sort of a gel. Some vegans use a chia and water mixture in place of an egg when baking. I also love to make chia puddings. Basically you just need to add some chia seed to a milk of your choice, along with your favorite flavor enhancements and a bit of sweetener and allow it to set up for a while in the fridge. One of the first protein 'balls' recipes I ever came up with uses chia seeds... these are really tasty little bites and if you like lemon, you will love them. Find the recipe for Lemon and Chia Raw Protein Ballz on my food blog here. Recently I received a few products from Chosen Foods to sample... a nice assortment and I was really excited to dig in after I opened the package. I had never seen chia seeds offered this way before. 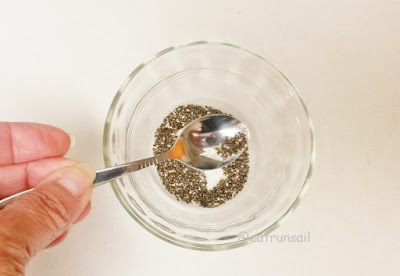 They are in individual packets, that contain 8g (just over 1/4 ounce) of chia seeds... and they are presented this way so that you can add a whole packet to a bottle of water and enjoy... easy and convenient and of course, portable. Toss one in your gym bag or tuck it into your pocket. Next time you need a little energy boost, mix the contents into a bottle of water and sip. I did shake it a few times to make sure I got most of the seeds out of the bottle as I drank the water. Odd at first, but quite nice, really. If you haven't given chia seeds a try, I urge you to pick some up soon. They are low in fat, high in fibre and a really good way to get in your Omega 3 each day. 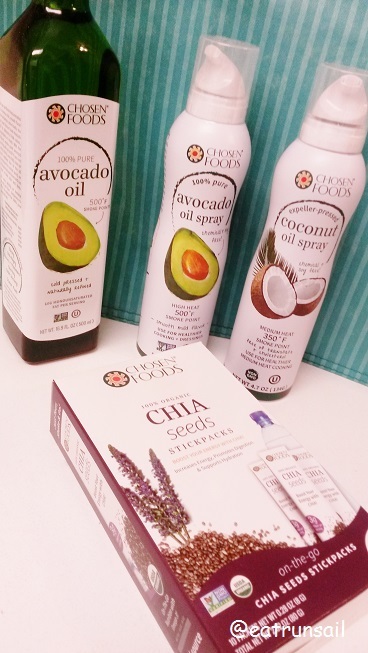 So, are you on the chia train these days, too? How do you enjoy them? 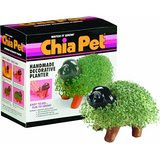 As soon as I saw the pic of the Chia Pet, that song from the commercial started playing in my head! "Ch-ch-ch-chia!" On a more serious note, we are eating more foods with chia seeds. I've actually never eaten Chia before!!!! My Dad loves them but I just haven't got into them. Oh my goodness the Chia Pet...I forgot about that! Do you remember they had different ones you could buy - different animals! Ha ha!!! LOL! i've always wanted a chia pet! I sometimes mix chia seeds in yogurt...not sure I could drink them in water, though. Those lemon protein balls look awesome! I love chia! I've never had them with just plain water. I use Chia occasionally in smoothies and other prepared foods for an extra boost. I'm not really fond of the texture, so I avoid drinks with Chia. Learn something new every day! I had no idea that chia seeds are the same as those in the chia pets. Crazy! And now i feel like an idiot. To be honest, I don't really eat chia seeds. The fact that they swell and get slimy squicks me out. I LOVE making chia pudding with them! So good!!! Haha...I didn't make the connection to chia pets before but yep...that's def where it all started! There are chia seeds in the protein powder that Bob's Red Mill makes. It took a while to get used to what that did to the texture of my "smoothie", but I ended up really liking it. So many fun memories with chia pets. And I remember the TV commercials for them too. 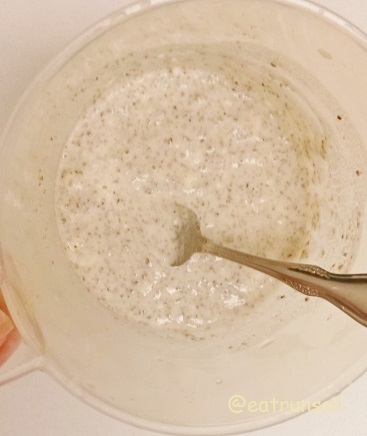 I love chia seeds, especially chia pudding! I can't help but sing the song ch-ch-ch chia, when I think about them. I laugh that THIS IS SO SO WHY I FLOSS SO MUCH AND SO WELL. They get stuck between my teeth since I eat em RAW all the time. I love chia seeds. I don't imagine me adding them to my water, but I love adding them to other things. I like chia seeds in smoothies, yogurt & have even had them in juice! I have yet to try them in plain water. Interesting idea! LOL! I used to have like 5 chia pets!!!!!! I don't use chia seeds nearly enough in my cooking but I need to change that! I loved my Chia Pet back in the day! I use chia in my protein balls and smoothies all the time. Also love them on Greek Yogurt.